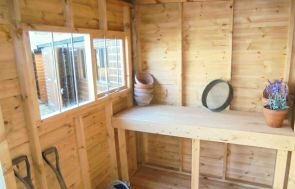 This handsome 2.4 x 3.0 Superior Shed installed in Headington, Oxfordshire will provide our customer with a space to work on home DIY projects and store gardening tools. 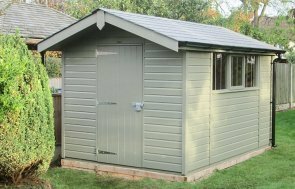 Part of our wider range of sheds, this model included an interior workbench and the exterior has been clad in shiplap, which was finished in our Sikkens paint. This coating of paint protects the wood while allowing the beautiful, natural grain to shine through. Alternatively, if you’re in the area why not visit us at our Oxfordshire show centre in Burford, to experience the luxury service we provide first-hand. We have over 25 different size and style garden buildings on display for you to view at your leisure. Should you have any questions or concerns whilst at one of our show sites, there will be plenty of members of staff on-hand to assist you. Our buildings can be customised to your exact requirements and all benefit from delivery and installation by our expert team as part of our end to end service. If you would like to find out more about our summerhouses, garden rooms, studios, greenhouses or timber garages you can do so on our website. 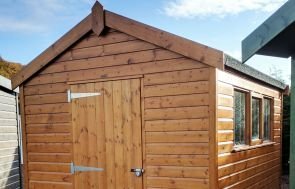 If you would prefer to see the full range of sheds on offer, click on the link below.